I’m a repeat offender when it comes to all things Spanish. And, although very distinct from Castilla and Madrid where I lived for two years, I was impressed each and every time I visited Barcelona. After various visits, I think Barcelona is absolutely wonderful, vibrant, artistic, and culinary hotspot (Really great tapas and cava on tap). Even through, I’m a raving fan with numerous visits to Barcelona, I always seek the advice and recommendations of those living and working in the area. 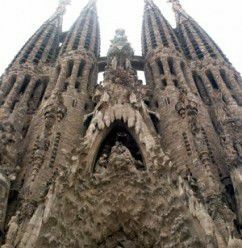 The post below showcases some of the highlights of Barcelona by Destinia.co.uk written by travel writer, Marina. Barcelona, located in the northeastern region of Cataluña, is a city known for its architecture and its culture. Gaudí’s presence is felt in the many architectural wonders that line this city’s streets, starting from Casa Batlló and La Pedrera and culminating in the Sagrada Familia Cathedral. The Sagrada Familia is Gaudí’s masterpiece, an unfinished Cathedral which has become the city’s symbol. The Cathedral is known for its intricately carved façade and its tall spires that loom over the city. Visitors can climb up the Cathedral’s steps and enjoy views of the city. For a taste of the city visitors can take a tour of the La Boquería market, a traditional market which sells fresh produce from all over the region. There are several bars inside the market where visitors can enjoy traditional tapas made from meat and fish and some local cava. Barcelona is a very walkable city. Exploring the city by foot is an affordable option that allows visitors to discover new places. A walk around the city’s Barri Gòtic, the Gothic Quarter, is an option for those who want to discover the city’s ancient architecture and enjoy finding hole in the wall places. The city’s Cathedral, several churches and many ancient buildings are located in this neighbourhood. There are many chic bars and vintage shops in this area waiting to be discovered. La Rambla is one of the city’s main streets, known for its many flower stands and street performances. The street runs from Plaça Catalunya, a centric square, to the Christopher Columbus statue located by the sea. Visitors who choose to stay in this area during their visit to Barcelona will have the city’s main landmarks on their doorstep. The Passeig de Gracia is another of the city’s main streets, lined with upscale restaurants and shops. The sidewalks are filled with modernist architecture buildings and terrazas where visitors can enjoy a caña and a sangría while admiring the local architecture. Sport is an integral part of the city. Barcelona F.C’s stadium, the Camp Nou, is located near the center of the city, and tickets for matches start from around 9€ per person. There is a museum inside the stadium. Visitors can take a walk around the Olympic Stadium built for the 1992 Olympic Games, which is one of the stops of the touristic bus that travels around the city’s main landmarks. For some fresh air, visitors can head for a walk to Parc Güell. 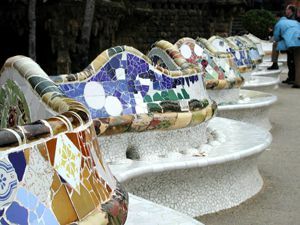 Designed by Gaudí, this municipal park greets visitors with a statue of a giant dragon made from colourful mosaics. The park is located on a hill, and there is an observation platform that has views towards the city and the sea. The Tibidabo Mountain is located a short distance away from the city. There is a large theme park on the mountain where visitors can enjoy roller coasters and many other attractions. Up the hill visitors will find the Montjuïc mountain. There is a cable car that runs from the city to the mountain which offers views towards the mountains and the sea. Visitors can spend the day in the Poble Espanyol, a small village designed with traditional houses representing each one of the country’s provinces. **Guest post provided by Marina, travel writer for Destinia.co.uk, providing hotel and hostel bookings around the world including Spain. I'm a repeat offender when it comes to all things Spanish. And, although very distinct from Castilla and Madrid where I lived for two years, I was impressed each and every time I visited Barcelona. After various visits, I think Barcelona is absolutely wonderful, vibrant, artistic, and culinary hotspot (Really great tapas and cava on tap).